Good morning! 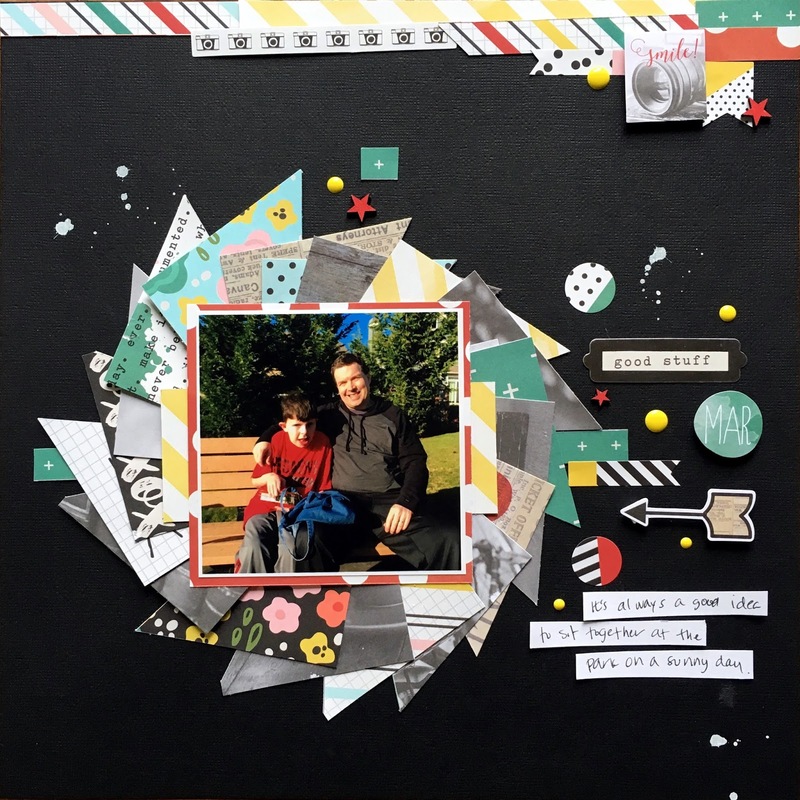 Today I get to share another layout created as Guest Designer this month at The ScrapRoom. On The ScrapRoom blog are several projects featuring the new Simple Stories Life in Color collection that is part of the FOTM kit. I used the Simple Stories page kit along with a few items from the Embellishment Add On kit to create this layout. Those triangles spoke to me and I wanted to use them in a bold way. I cut 3 of the strips apart and layered them until I had a look that I liked. To balance all of the angles, I added various sizes circles. circles. To balance color, I placed strips of paper at the top of the page as well as a few red inked wood stars from my stash. There isn't anything super special about this photo. It is more of a reminder to us to stop and take in the moment form our son's perspective. It may be just another walk to the park for us, but for him it's the journey. He takes it all in. To us we wonder why he doesn't want to go down the slide. To him, maybe he's just fine watching everyone else. So sitting on the park bench for a moment slows us down. Maybe so that we can take in the moment as well. Thanks for stopping by my creative view today. I've got some more projects to share, so come back again soon.